We had the honor of being the first band of Mexican folklore, along with other prominent singers of mariachi music, in singing rancheras in Catalan (Ranxeras en català). In the event, we participated alongside soloists like Josep Perez Abuyé, “the charro” and Roberto Aguilar, who is highly regarded even in much of Central and South American countries. Both have a long history in Catalonia playing Mexican songs in various scenarios. With both we have created close ties of friendship for professional and personal reasons. Previously, other music had been sung and / or translated to be heard in the native language of this land, Catalan. However, it was not until 2011 that this project was proposed in partnership with MexCat and we were able to hear the first songs of our Mexican folklore in the language of this land. During the performance we opened the concert and interpreted “the Querreque” with verses made ​​expressly for performance in Catalan; afterwards, we accompanied Roberto and Josep who performed some of the most popular songs from the repertoire of mariachi such as “Cielito Lindo”, “love of two “or” Go Back “. After the event, Albert Torras, one of the founders of Mexcat, sang “The King” in Catalan and we made choruses along with the audience. In Catalonia, many singers have done homage to Mexican music and musical history of our twinning is long, just to mention the fact that Jaume Nuno, de Sant Joan de Abadesas is the music composer of the Mexican national anthem, so we contribute our grain in this rough and tumble history of music in the ratio of two lands. So, we were responsible, with the soloists mentioned, for singing rancheras in Catalan for the first time. The event took place in the theater that housed up to 500 people. The Casinet d’Hostafrancs was filled for the first time to hear these songs in their native language. The event was sponsored by the Sol Mexican beer and Oro de Oaxaca Mezcal and Yuu Baal. The event was attended by personalities like Núria Feliu, the director general of immigration of the Generalitat of Catalonia, Xavier Bosch. The Director General of Linguistic Policy of the Generalitat, Yvonne Griley. The Consul of Mexico in Barcelona, Norma Ang. The Barcelona City Council commissioned Miquel Esteve. The secretary of Democratic Convergence of Catalonia, Angel Colom, among others. Looking for a group of Mariachis for your theater? 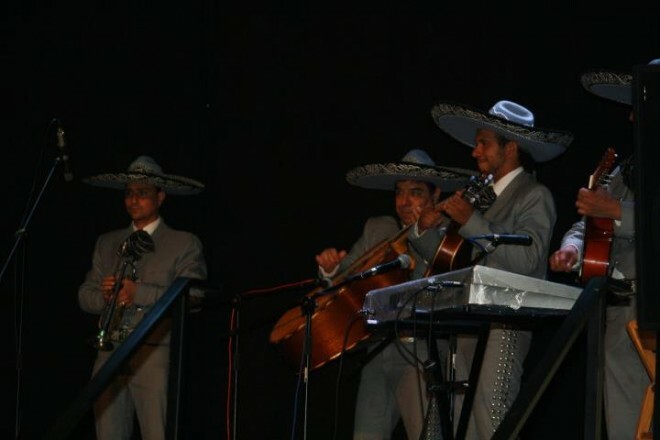 If you are looking for a mariachi group to take action in any event you make in your theater, or theater that you are making negotiations with for any event, we have prepared a musical service for theater concerts. We explain all the details. If you’re interested, contact with us to act on your theater.